Are you looking for a business gift that will present your logo in useful way? 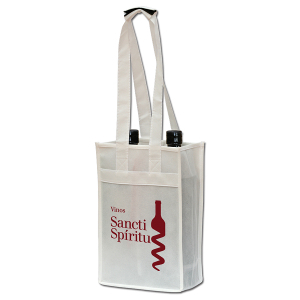 Two bottle wine tote, B310, made for 90 GSM polypropylene make a great way to tote vino home from the store or wine shop. Also make great business gifts or favors at an event. Large imprint area, 5 x 5 inches, and available in burgundy, black or white. Prices start at 1.79 ea for 150 pieces, 1.74 ea for 300 and 1.69 ea. for 600 pieces, 1.64 for 1200 pieces and 1.59 for 2400 pieces. 5 x 5″ imprint area, one color, one location. Screen set up is 50.00 one time. Light to ship, this item is sure to be popular item at any tradeshow or event. 4 and 6 bottle totes also available for additional.